Whether you’d describe yourself as an artist, a crafter, a decorator, a hobbyist or just someone having a bit of fun; we’ve all got one thing in common. When it comes to getting creative, sometimes we can find ourselves stuck for inspiration. It’s hard to pinpoint exactly what can gum up the works; you may not know which materials you need, which colours to use, or maybe you’re not sure about the finer details of the idea you want to execute. Creative blocks can happen to anyone and are pretty common, so don’t beat yourself up if you find yourself stuck. We’re lucky to live in an age where we have unprecedented wealth of ideas and visual information shared online, not to mention there’s also a bunch of handy creative tools on the ‘net. We’ve found some of the best of them to help you get inspired, brush up on your skills and work through any pesky blocks you may have. Even if you’re not working on a project right now, have a look through and see what’s out there – you never know, it may help you down the track! Colour plays a huge part in all kinds of creative projects and Pigment by ShapeFactory is the place for you! 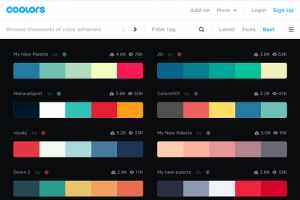 With an ultra-simple website interface, they’ve got dozens and dozens of simple colour schemes to browse – you can even change the pigment and lighting as desired. Hover your mouse over any colour scheme and you’ll also see a range of tints and shades. 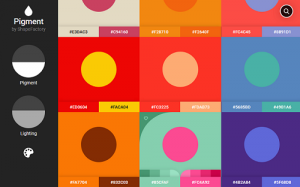 Staying in the realm of colour, Coolors is also home to hundreds of different colour palettes submitted by users from around the world. These five-colour palettes are a little more complex than the ones you’d find on Pigment so you may find it useful for more detailed projects. If you sign up for a free account, you can even save your faves for future reference! Sometimes you just need to doodle aimlessly until an idea comes to you. 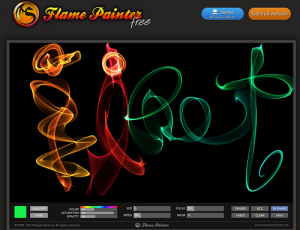 Next time you feel the urge to play around with shapes and lines, have a go on Flame Painter. This art tool produces glowing, translucent lines with a lively sense of movement, just like fire! If you’re more of a builder than an illustrator, why not have a go at making your own font? 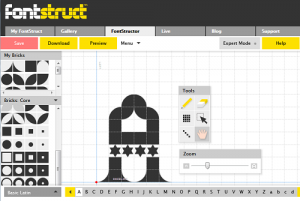 FonStruct is a tool that gives you the bits and pieces you need to design your own font, letter by letter. It’s an unusual project that could help shake things up and get you thinking differently and best of all, you can download and use your font once you’re done! It’s also a cost-effective option if you’re starting out a new business and want to design your own logo and documents. Every now and then, you may find yourself discouraged if you’re having trouble getting your project to fit the vision you have in your head. More often than not, it comes down to practice, patience, and technical skill. While practice is pretty straightforward, learning new skills can be more complicated. 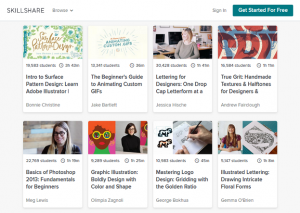 Fortunately, Skillshare offer a number of online classes for Design, Film, Photography and more. You can get started with a selection of free classes and if you find yourself really get into it, you can consider getting a premium subscription for unlimited access to over 25,000 classes provided by experts. 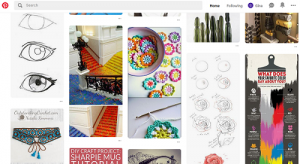 Depending on your interests, you may already know about Pinterest. Over the years, the website has become a titanic source of art, crafts, fashion, interior design, food, party themes – you name it! The main focus on content is visual imagery so it can be a great way to find your creative spark, plus you can tailor your feed to your specific interests and save your fave finds. You’ll need to make an account in order to browse, but if you have a Facebook or Google account, you can link it to Pinterest and you’ll be scrolling for inspiration in no time! If you’re a little overwhelmed by the sheer volume of content on sharing sites like Pinterest, then a curated feed may work better for you. 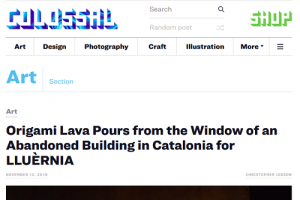 Colossal features the cream of the crop from art, photography, design, craft and illustration from around the globe! With unusual and stunning projects like origami lava, mass-produced puzzle mash-ups and a full-size 1980s supermarket made out of felt, it’s bound to help get you inspired and thinking out of the box. 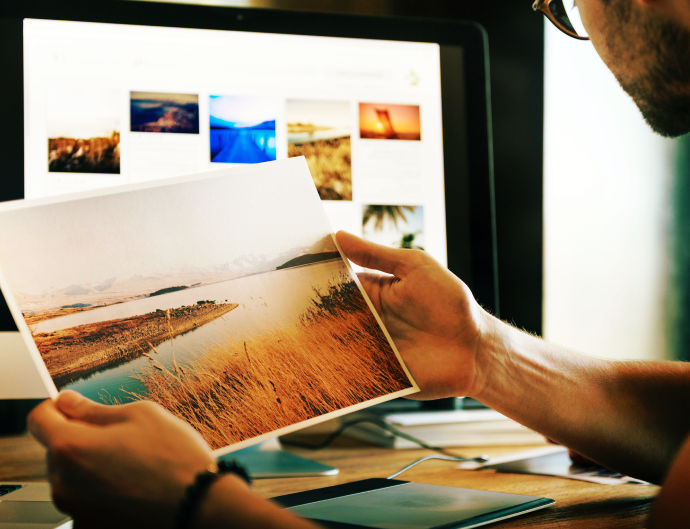 Do you have any creative tips and go-to apps up your sleeve? Share them with us in the comments. I noticed that my modem has 2 green ports at the rear for NBN but the sizes are smaller than the yellow ports. So, I will need 2 NBN cables for my 2 computers which are currently operating on 2 different occasions. The first cable can be the short one because the modem is situated under the computer desk but the second cable needs to be much longer so that it can reach the other computer in the next room. I suspect that these cables will be green in color for accommodating the green ports. OK, when I switch over to NBN, will the modem have to go through any procedure before it starts working again? This is very interesting! This does depend somewhat on the type of NBN connection that will be available to you. For instance, FTTN connections can use an NBN certified modem of your choice, however if its something like NBN HFC, you may well need a new modem altogether. If you like, please feel free to have a chat to us about this via iiOnline@iinet.net.au. Let us know what modem you currently have, include your details and mention your post here – we can always have our team have a chat to you about what it possible! Sticky notes are good – who is going to invent the first coffee infused sticky note. Just drop into hot water for a super strong coffee drink. Now this sounds like a great invention Michael! Would you write on them first and then reuse as a hot beverage?